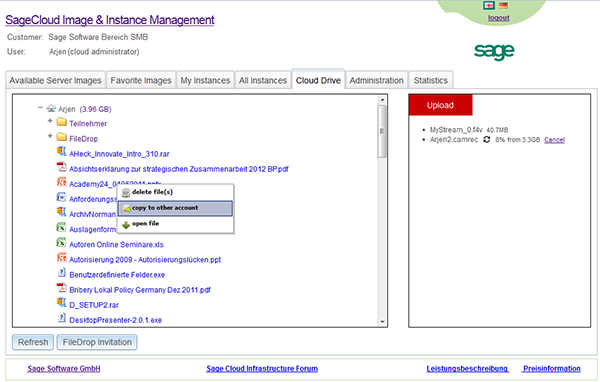 Sage Software GmbH provides business software and services to more than 250,000 organizations throughout Germany. The company is a subsidiary of the Sage Group, one of the world’s largest providers of Enterprise Resource Planning (ERP) software. Sage Software has approximately 700 employees in Germany and works with more than 1,000 product resellers. Sage Software’s offerings are based upon more than twenty-five years of experience, and each solution is expertly tailored to meet local customer requirements. The company’s extensive portfolio includes material management, production, accounting, business intelligence, human resource management, customer relationship management, and industry-specific solutions. The Sage German Professional Services unit of Sage Software is responsible for consulting, training, pre-sales presentations, data migration, and replication of customer support cases. The Professional Services team needs to run parallel systems for conducting training and for customer support. For example, a Developer Consultant may need to have a training project running virtually on one machine and then start a second machine to review a customer’s issue. Additionally, team members often set up an application server and a database server in parallel so that students can work with them during a training session. With this approach, it often took the Sage Software team at least two hours to install and configure virtual machines on employee notebooks and customers’ local computers, and despite the extensive preparation, the virtual machines often performed poorly. After an eight-hour training or consulting session ended, employees would then spend an hour converting the systems back to their original states. The company knew that there had to be an easier way. By using the Sage Cloud Services Portal, the Professional Services team is now typically able to handle the entire set-up for its training and consulting sessions within minutes. Thorsten Lass explains, “Instance actions, such as create, stop, start, and terminate, can very easily be scheduled as an event. For example, now we can terminate all instances automatically after a training class, thereby eliminating the generation of unnecessary cost.” Figure 1 below illustrates a scenario using the Sage Cloud Services Portal for image management. Within the Sage Cloud Services Portal, the Sage Software team also used AWS to develop a solution called Cloud Drive, which allows users and third parties to upload and share their own files with colleagues, customers, and partners. 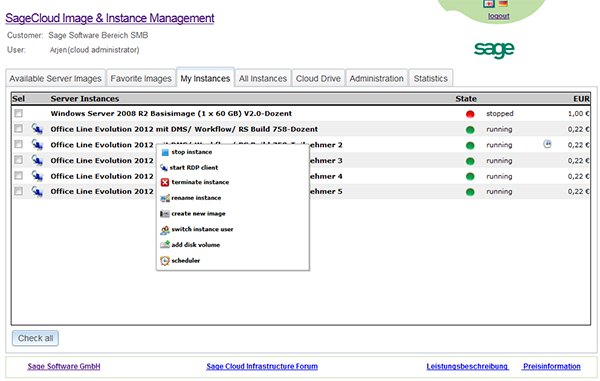 This feature expedites customers’ access to material and lightens the workload for Sage Software employees. Figure 2 below illustrates the Cloud Drive. In addition, the Sage Cloud Services Portal lets customers try new products through a remote desktop protocol (RDP) connection for a predetermined amount of time. When the evaluation period is over, the connection can be automatically disconnected. The portal also includes a multi-tenant structure that gives Sage Software’s business partners access to relevant billing information, further reducing the company’s administrative overhead. Moreover, this new productivity is not only limited to Sage Software’s operations in Germany. Sage Software is also leveraging Amazon EC2 for its SalesLogix Customer Resource Management (CRM) system, available in the United States. To learn more about how AWS can help your business application needs, visit our Business Applications details page: http://aws.amazon.com/business-applications/.